Ah, chocolate, how I love thee. Those close to me know that a good piece of chocolate (or a brilliantly chocolate-infused recipe) can be a total game changer in my day. In fact, I try to make a little indulgence a fairly regular ritual. Just ask my co-workers who continue to sabotage my chocolate Achille's heel by keeping a fully stocked dish of chocolate on their desk at all times. Either they love to see me popping in and out of their office regularly, or they just love to test my will power... either way, I can't say I don't enjoy it! Lucky for me and my fellow chocolate-loving readers, studies have shown that chocolate has some pretty notable health benefits. So, when I was invited to join the Boston Brunchers in visiting Chocolate Therapy, a new chocolate shop in Framingham, Mass. (their first location, a 2-year-old shop, is in Dedham, Mass.) inspired by the therapeutic and healthful benefits of chocolate, I knew I was in for a treat and quite literally jumped at the opportunity to meet the masterminds behind this guilt-free chocolate venture. 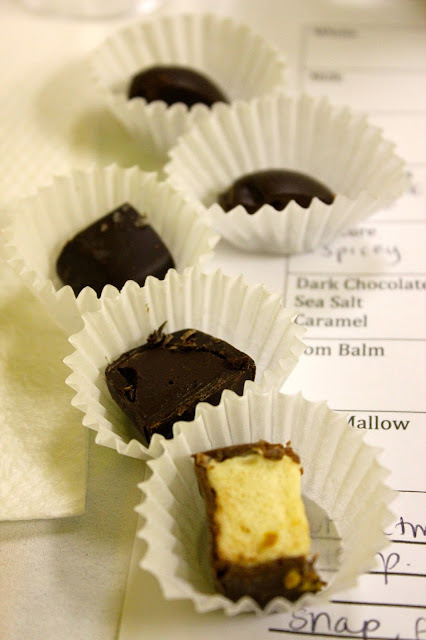 Upon walking in the door at Chocolate Therapy's Framingham location, your senses are immersed by chocolate. Owners Pamela and David Griffin welcomed us with a smile and whisked our group into an event room where the sights, smells, sounds, tastes and touch of chocolate were abounding. We met Rick the chocolatier, and kicked off the evening with a Chocolate Therapy "flight." I was so excited to taste a number of their signature treats, and of course they did not disappoint. We sampled the "Chocolate Fix," a delicious dark chocolate truffle; "The Cure," a just-the-right-amount of spicey dark chocolate and cinnamon treat; the "Dark Chocolate Sea Salt Caramel," their number one seller, and rightfully so -- it's buttery caramel center surrounded by top-quality dark chocolate sprinkled with himalayan sea salt was divine; the "Pom Balm" a dark chocolate and pomegranate delicacy; and the "Buzz Mallow" a completely unique and delicious marriage of homemade marshmallow, honey, bee pollen and milk chocolate. After enjoying our samples, we all convened in the kitchen for a mouth-watering behind-the-scenes peak at how it's all done. After Rick's demonstration of homemade ganache and the art of tempering, we all proceeded through a chocolate-making-circuit (my favorite kind of circuit training, ha!) of creating truffles (using their coater, which is adorably named Lucy! ), chocolate bark with assorted yummy toppings, raspberry-filled chocolates, and cocoa and pistachio coated truffles. Pam, David and Rick were all such great, friendly and fun teachers! And, at the end of the evening, we were all thrilled to leave with goodie bags filled to the brim with the fruits of our chocolate-making labor. If you're in the area, don't miss Chocolate Therapy. Owned by a truly passionate and talented couple, I have no doubt that this local business is here to stay. Stop in and enjoy one of their lovely signature chocolates, a scoop of ice cream, a warm beverage, or (hopefully) a glass of wine this fall (they're hoping to have their liquor license secured by then). Can you say, "wine and chocolate pairings"?! I'll surely be back! *While this tasting was complimentary, these opinions are honest and entirely my own. Spring has sprung! Though it may not feel like spring in the northeast quite yet, Easter is just around the corner. Growing up, Easter was always one of my favorite holidays because it packed so many things I loved into one day... baking, brunch, pastels, creative egg-dying, warm weather (in theory), family time, and of course, all the Easter bunny's treats. Well, it turns out that things don't change all that much as you grow up. I still love Easter for all of the same reasons and this year, I'm psyched to share an amazing Easter treat recipe that will put the perfect sweet finishing touch on your holiday meal. This perfectly moist and fabulously flavorful traditional carrot cake recipe comes straight from the cupcake experts themselves: Katherine Kallinis and Sophie Kallinis LaMontagne, the Georgetown Cupcake sisters! And in an amazing turn of social media events, Katherine and Sophie tweeted their approval of my version of their recipe in response to a photo I posted on Instagram (see below)! If that's not reason enough for you to give these a try for your Easter get together, I don't know what is! The tender cupcakes are packed with freshly grated carrot and tart apple. Topped with a cloud of thick, vanilla cream cheese frosting and a sprinkle of your favorite springtime sprinkles, these treats are sure to give the Easter bunny a run for his money! ;) Enjoy! For the cupcakes: 1.) Preheat the oven to 350F. Line a standard cupcake pan with twelve paper baking cups, and a second pan with six baking cups. 2.) Sift together the flour, baking powder, cinnamon, and salt. 3.) Place the butter in the bowl of a stand mixer or in a bowl with a handheld electric mixer. Beat on medium speed until fluffy. Stop to add the sugar; beat on medium speed until well incorporated. 4.) Add the eggs one at a time, mixing slowly after each addition. 5.) Reduce the speed to low. At this stage, it's always important to mix as slowly and as little as necessary since you don't want to traumatize your batter. 6.) Add one third of the flour mixture to the butter mixture, then gradually add one third of the hot water, beating until well incorporated. Add another third of the flour mixture, followed by one third of the hot water. Stop to scrape down the bowl as needed. Add the remaining flour mixture, followed by the remaining hot water, and beat until just combined. 7.) Using a spatula, fold the grated carrots and apple unto the batter. 8.) Use a standard-size ice cream scoop to fill each baking cup with batter, so the wells are 2/3 full. Bake for 18 to 20 minutes (start checking at 15 minutes) or until a toothpick inserted into the center of a cupcake comes out clean. Transfer the pan to a wire rack to cool completely. For the frosting: Place all ingredients in the bowl of an electric mixer fitted with the paddle attachment; beat until well combined. Be sure to beat on high speed for at least 2 minutes at the end to ensure that the frosting is light and fluffy. For the decoration: Line up cooled cupcakes on a sheet of wax paper. Transfer the vanilla cream cheese frosting into a plastic piping bag fitted with a large round metal tip (or piping tip of your choice). Apply a signature swirl (see below). The Georgetown Cupcake Signature Swirl: The frosting on Georgetown Cupcakes has a certain "style" to it — a perfect little cloud that reaches a pretty peak in the center. It's just the perfect amount of frosting — not too much, not too little — and it looks neat and sweet! Since I love you all so much for reading this crazy blog, I decided to bake you a Valentine's treat to make your heart happy (literally). With a hint of almond, smothered in raspberry jam and topped with a dusting of confectioners' sugar, these cookies are the perfect sweet treat to share with your loved ones this Valentine's Day. Pair them with a warm cup of tea or hot chocolate for an even fancier indulgence! Have a heart (pun intended) and celebrate Valentine's Day with Raspberry Almond Linzer Cookies made with love. Enjoy! Directions: Preheat oven to 325°F; line 2 baking sheets with parchment. Beat butter and 2/3 cup sugar until fluffy. Beat in egg yolk, vanilla and almond extract, then flour and salt. Shape dough into 2 disks; wrap in plastic and refrigerate for at least two hours. On a floured surface, roll out dough to about a 1/8-inch to 1/4-inch thickness. Cut out cookies with a medium or large heart-shaped cutter. Use a smaller heart cutter to cut a window out of half of cookies. With a spatula, carefully transfer cookies to prepared baking sheets. Repeat with remaining dough. Gather scraps and roll out again to make more cookies. Bake cookies in batches until edges of cookies are just golden, 10 to 12 minutes. Let cool for 5 minutes, then transfer cookies onto wire racks to let cool completely. Spread 3/4 tsp. jam over flat side of each cookie that doesn't have a window. Sift 3 Tbsp. confectioners' sugar over each cookie with a window. Top cookies with jam with window-cookes flat side down, so that jam shows through windows. Enjoy! Makes about 6-8 cookies (I doubled the recipe). There is something so uniquely special about cake. To me, cakes evoke wonderful (and delicious) memories of birthdays, weddings, holidays, congratulations... and in this case, a Confirmation! I love the idea that such a sweetly simple treat can quite literally be the frosting on top of a happy get together with loved ones. After all, what's better than breaking bread (I mean, cake...) with family and friends? This cake should be a staple in every baker's cookbook. The recipe is super basic and hugely modifiable when it comes to incorporating your favorite ingredients. The cake is dense without being too rich and the fresh blueberries add the perfect burst of sweet, spring-inspired flavor. Depending on how you prepare it, I think this cake could even work as a breakfast treat! For the Blueberry Cake: Preheat oven to 350°. Generously grease an 8-inch round cake pan. Whisk flour, baking powder and salt. Set aside. Using an electric mixer on medium speed, beat butter, sugar, and brown sugar until creamy. Add egg and vanilla, mixing well. Add flour mixture in 3 portions, alternating with the milk. Mix just until combined. Transfer batter to prepared pan. Scatter blueberries over the top of the batter and lightly press them into the batter. Sprinkle top with sugar. Bake for 10 minutes. Reduce oven temperature to 325°. Bake for 50-60 minutes, or until cake is golden brown and firm. Recipe adapted from Bake or Break. For the Lemon Mascarpone Frosting: Beat mascarpone cheese and whipping cream together until smooth and slight peaks begin to form. Sift in the powdered sugar and zest. Beat until smooth. Mix in the vanilla extract and spread on cooled cake. "Cold" does not even begin to describe the weather we've been experiencing here in the northeast. I feel like I'm on Survivor. I'm considering making t-shirts that say "I survived Winter 2013," if I indeed make it through. It's that bad. Just hearing the weatherman say it "feels like" -14F outside (yes, negative 14F, not just 14F) makes me want to hide under the covers. Like, all day. Unfortunately, we all typically can't enjoy such luxuries. So, naturally, we need something to coax us out of our warm hideaways and face the day. 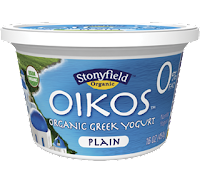 And, so, when my friends at Kretschmer Wheat Germ and Stonyfield Oikos Greek Yogurt asked me to give them a try, I knew it was the perfect opportunity to create a nice, hearty and healthy bowl of spicy chili. Packed with tons of nutrients and topped with some of your favorite shredded cheese and a dollop of Greek yogurt, this chili is the perfect way to warm your bones. 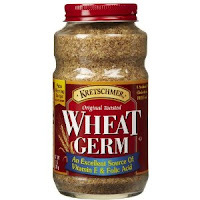 Did you know that wheat germ is essentially a superfood? Derived from the most nutrient rich part of the wheat kernel, wheat germ is an excellent source of nutrients including vitamin E, the B vitamins, and folic acid. Aiding in everything from muscle function, to red blood cell production, to digestive tract health, wheat germ packs big benefits in a small, 50 calorie package. 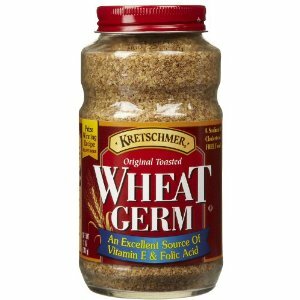 Wheat germ even supports a healthy nervous system which can lower anxiety levels and improve mood! Needless to say, I was shocked to learn about exactly how much value such a seemingly innocent ingredient could bring to a recipe, and decided to incorporate it into the mother of all comfort foods: chili. Along with its long list of nutritional benefits, the wheat germ added another layer of flavor and brought a heartier texture to the chili. And, instead of using a high-in-fat sour cream topper, the Greek yogurt brings the same tanginess, along with tons of protein, calcium and probiotics, too! I opted out of adding meat to this batch, but if vegetarian isn't up your alley, you can easily add in some ground beef or turkey. From the wheat germ, to the array of veggies, to the healthy Greek yogurt topping, this recipe is loaded with guilt-free flavor. To boot, leftovers travel well to the office for an easy microwavable lunch! Heat oil in a 4-quart saucepan over medium-high heat. Add the onion, pepper, celery, and carrots and sauté until soft and onions are translucent, about 5 to 7 minutes. Add in the grape and sundried tomatoes, tomato paste, diced tomatoes, diced jalapeño, beans, and vegetable broth. Stir to combine. Mix in salt, oregano, cayenne pepper, paprika, and chili powder. Cover and bring to chili to a bowl and then lower to a medium heat and simmer for 45-50 minutes, uncovered. Stir in wheat germ and remove from heat. Serve in bowls garnished with freshly grated cheese and Greek yogurt. *While I did receive coupons for complementary Kretschmer Wheat Germ and Stonyfield Oikos Greek Yogurt, these opinions are honest and entirely my own. You guys, these cookies are just too darn delicious to be "healthy." I know what you're thinking. Healthy twists on dessert don't usually present a lot of finger-licking goodness in the taste test department, but these cookies are the ultimate exception. Can we talk about their gooey texture, packed perfectly with the flavors of nutty oats, walnuts and whole wheat, rich dark chocolate, and bright, fruity craisins? Not to mention, you're experiencing all of this amazingness for about 100 calories per cookie. I know whole wheat flour isn't a standard pantry staple, but you can pick up a bag of it for about the same price as regular all-purpose flour at almost any grocery story. And, just think of all the delectable whole-wheat-flour based treats you can create with your new fancy bag of way-better-for-you flour?! The possibilities are seriously endless. Or, you could just whip up like a bajillion of these cookies. I wouldn't count that outside the realm of possibility. They're that good. My family and I ended the year on the beautiful beaches of Marco Island, Florida and indulged in all of the joys vacation brings: family time, fabulous food and drink, sun and sand, more amazing food and drink... did I mention we like to eat? The restaurant tour de Southwest Florida left me feeling a little less than in fighting shape upon arriving back in the real world to kick off 2013. So, while a healthy diet and regular exercise have always been an important part of my lifestyle, I vowed to kick things up a notch this year, not only to recover from our indulgent trip, but also to challenge myself to be a better me in 2013. I know what you're thinking. This is sounding an awful lot like a new year's resolution. I, for one, think that's just a matter of semantics. Anyone at anytime can decide to make a change for the better; we don't need a new year (hence my idea to add sliced almonds to my greek yogurt this morning -- can't believe I've been missing out on this genius addition all this time!). To me, the idea of a "new year's resolution" comes with a whole lot of pressure and tends to bring out the crazy in people. So, instead, I'm just opting for a better balance in all aspects of life for not only this year, but for years to come. Be it nutritional, social, spiritual, physical, professional, mental or personal balance, I'm aiming for a better balanced me in 2013. Now, doesn't that have a nice ring to it? And because I'm all about balance these days, that means I'm not ruling anything out -- specifically, including such beautiful and delicious dessert entities as cake. In fact, I might argue that I am as pro-cake as you can get. Especially when there is celebrating to be done. So, naturally, when I was invited to a dinner party in honor of a variety of celebratory occasions last weekend, I knew it was time for a cake. This decision may or may not have also been heavily influenced by the fact that I received a brand new, raspberry colored KitchenAid mixer for Christmas (OMG! ), and so of course, I had raspberries and delicious whipped things on the brain. For the Lemon Cake: Preheat oven to 350°F and place oven rack in the center of the oven. Spray an 8 inch cake pan with non stick cooking spray, and then line the bottom of the pan with parchment or wax paper. In the bowl of your electric mixer (or with a hand mixer) beat the butter and sugar until light and fluffy and pale in color (about 3-4 minutes). Scrape down the sides and bottom of the bowl as needed. Beat in the vanilla extract. Add the eggs, one at a time, mixing well after each addition (batter will look curdled). Sift or whisk together the flour, baking powder, salt, and lemon zest. Add the flour mixture alternately with the lemon juice, mixing until you have a smooth batter. Pour the batter into the prepared pan, smoothing the top with the back of a spoon or an offset spatula. Bake about 40-50 minutes, or until a toothpick inserted in the center comes out clean. (Do not over bake or the cake will be dry.) Place on a wire rack to cool for about 15 minutes, then gently remove the cake from the pan. Allow to cool completely before frosting. In a food processor or blender, puree the raspberries. Place butter, half of the powdered sugar, and raspberry puree into mixing bowl. Beat over low speed until well-blended. Add the other half of the sugar, increase speed to medium. Mix until light and fluffy. Frost cooled cake with the raspberry buttercream and garnish the cake with fresh raspberries, if desired. Please excuse the iPhoneography in this post. My lovely DSLR promises to make its comeback in the next post. Check back soon! Hi! 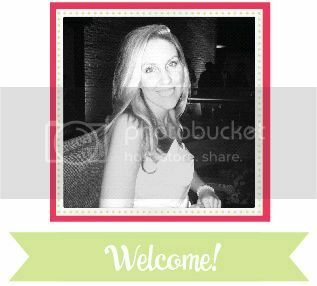 Thanks for visiting Chelsea's Choice, a place for me to document and share my passions with you! Join me on my journey to live each day to the fullest by appreciating the little things in life. After all, don't they usually turn out to be the big things? Enjoy! © 2011-2013 Chelsea Dugan. All rights reserved. Powered by Blogger.